Prepare a 9 inch spring form pan with a parchment paper at the bottom. The pastry can be made by hand with your finger tips, by using two butter knives or simply in a food processor using the pulse button. Knead together and leave it to rest. Bake in a preheated oven of 325F/160C for 8 to 10 minutes until a slight colour shows on the pastry. Using the rest of the 1/3 pastry, cover the sides of the pan. Using your thumb go around the edge to make it equal in height. Once it is smooth pour into the prepared shell. Place in a hot oven of 400F/200C and immediately reduce the heat to 275F/140C. Allow it to set for 40 minutes.Turn off the oven and let the cheesecake cool for an hour until it sets.Chill and serve. The cake must jiggle in the center. It will then set as it cools and that softness is what the creaminess depends upon that tastes delicious. 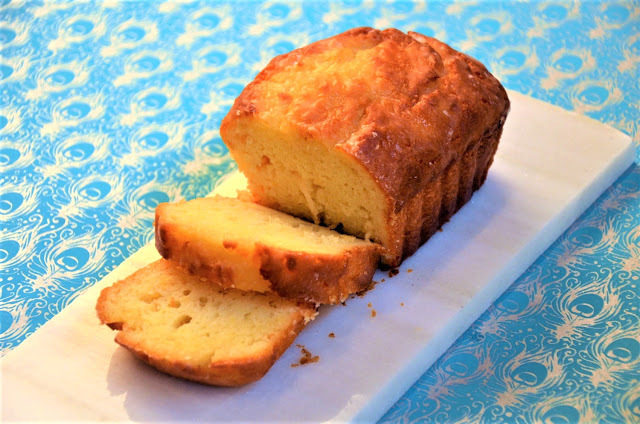 Clementines work best for this cake. The skin is softer and less bitter. The juice of it is tangy and flavourful. 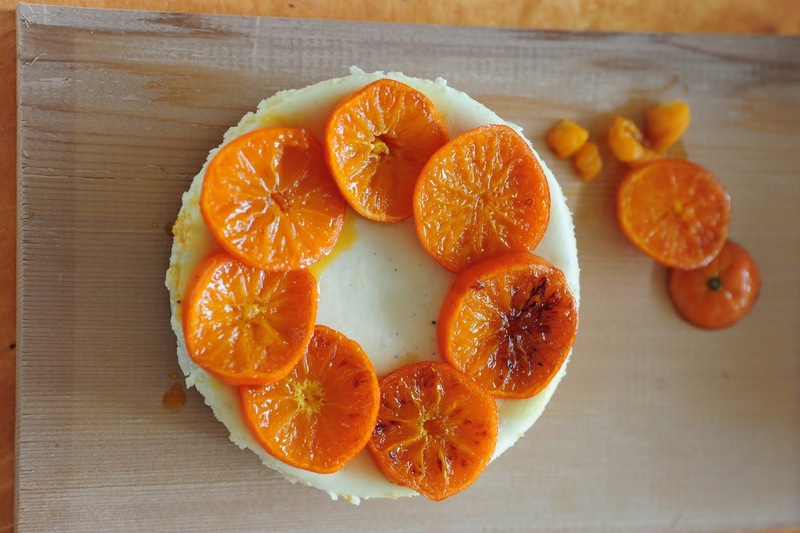 When ready to serve, evenly slice 2 clementines and grill them on a hot skillet for 2 minutes. Turning once. Top the cooled cake with the slices. The juices of the fruit will enhance the flavours of this cake.The texture of this cheese cake is dependent on two things. 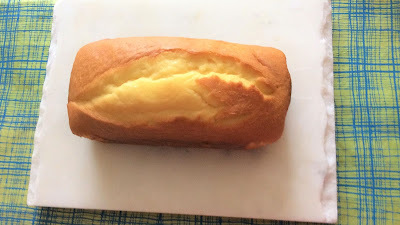 The smoothness of the filling. So make sure its silky and not at all grainy. This in turn is dependent on the cottage cheese you are using. For best results use freshly made paneer while its warm or bring it to room temperature before use. Secondly the baking. Over baking makes the texture grainy. Allowing it to set on a lower temperature slowly ensures that the mixture does not curdle, or get too hot at any point. The "Jiggle in the Middle" is crucial when you finish. The cheese cake is delicious on its own but a mixed berry compote makes it look prettier and tastes even better. Lemon curd topping for the lemon lover, and dark cherries topped all over can be absolutely amazing. Passion fruit curd is my very favourite. It is a strong taste and start with mixing lemon and passion fruit to avoid the pungent flavour which may be not to everyone's delight. Do not freeze this cake as the texture is ruined. This crust can be made in minutes when you use the food processor and the texture remains the same. Use the pulse button for best results. Place the spring-form pan on a tray to avoid having to clean up any "drip" from the pan. Prepare a loaf pan with parchment. Butter and flour it. In a bowl mix together the yogurt, sugar, eggs, lemon zest and vanilla. In another bowl sift together the flour, baking powder and salt. Using an electric hand beater mix the dry and wet ingredients. With the beater on a low speed add the dry ingredients into the wet ones. Add it a spoonful at a time. Once smooth add the oil in a gentle pour. With a spatula mix it all in properly. Pour the batter into the prepared pan and bake for 40 minutes. Place a tester in the center to make sure it is clean. Cool for a few minutes and remove on a serving platter, brush and pour the syrup till all of it is absorbed. Once dissolved add the limoncello. Allow it to boil for a minute before brushing it over the warm cake. Optionally you can also dress it up by making icing with the juice of half a lemon mixed in with 3 tbsp icing sugar to drip over. Decorate with slices of lemon. Do not over beat the cake. But it must be smooth and not lumpy. While Limoncello is an option, fresh lemon is a must. Do not use olive oil instead a light oil that has no taste or flavour is best. Yogurt has to be full fat and not skim. Oven must be pre heated. Loaf pans are generally of one size generally 9" x 5" /23 cm x 13 cm being the largest and 8"x by 4" 21 cm x 11 cm being the smaller one. Either will work well. Lassi is a typical street food of the Subcontinent which would include India, Pakistan, Bangladesh and Sri Lanka. While it generally refers to anything whipped up in yogurt and ice (thinned down with water or milk), it can be flavoured with any variation from salt and pepper, to sugar, rose, mango, saffron, cardamom and other choices. It keeps one refreshed while the weather is humid and hot. It is also a simple way of keeping hydrated, nourished and healthy for the masses. 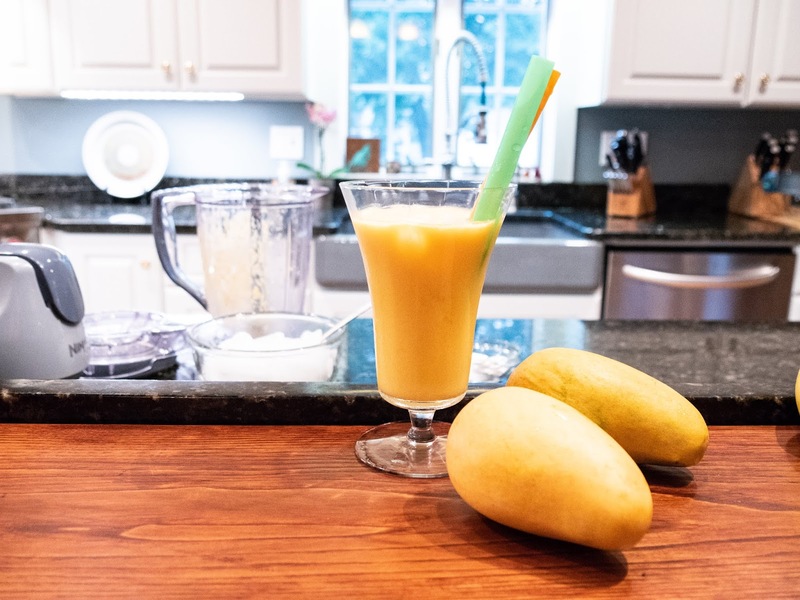 Blend all the ingredients with an immersion blender /food processor/ liquidiser. Add cold water or milk to think it down if preferred. 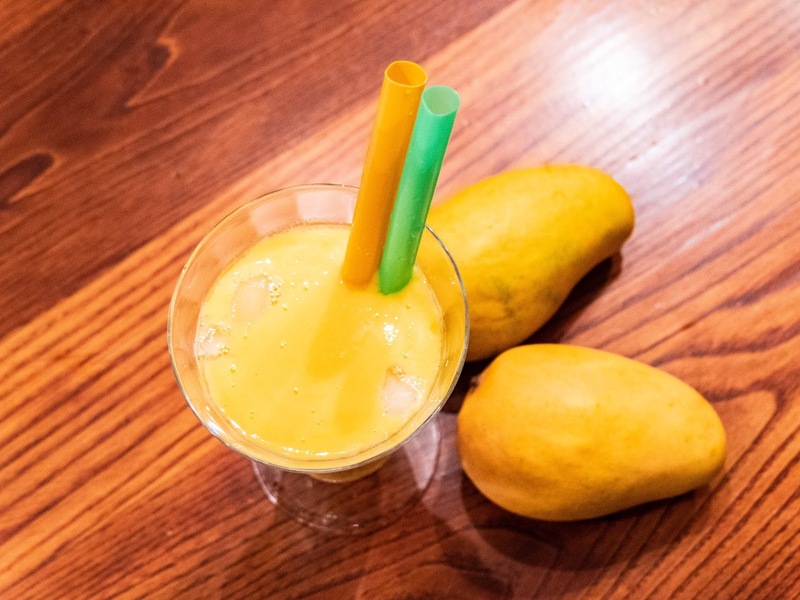 A squeeze of fresh lime or lemon juice helps bring out the flavour of the mangoes. While it is unlikely, if the mangoes are not sweet add sugar, honey or agave to sweeten to your taste. This curry reminded me of my favourite Dahi ni Kudhi (only with coconut milk instead.) The very subtle flavours magically come to life when the balance is impeccable. It has the wonderful Sri Lankan flavours enhanced with the Pandan leaf. Its a quick and simple curry perfect for any family meal. In a wok or deep skillet heat the oil, add the shallots and lightly saute until translucent, soft and have a slight tinge of caramelisation. Add the mustard sees, curry leaves, garlic and green chillies and continue stirring for a minute or two and add the turmeric. Mixing constantly on a medium high flame, until the turmeric is well blended and there is a slight bubbling in the pan, to ensure the turmeric is cooked through. It will take up to 5 minutes at most. Add the coconut milk one can at a time, mixing it all and continuing to add the coconut water. Bring it all to a rapid boil and add the rest of the ingredients. Reduce the heat to a gentle boil, leave the pan open and allow it to cook for 30 minutes until the liquid has halved, the curry is thicker, enough to coat the back of a spoon. Add the prawns at this time. Leaving the heat high and cooking the prawns for 5 minutes until just done. Cover the pan, turn of the heat. Wait for 3 minutes and serve with your favourite kind of rice.Choosing from any of these like plain boiled rice, ginger rice, lemon rice or coconut rice. Substitute the shallots for 3/4 of a cup of crushed fried onion from your pantry. Light coconut milk can be used and coconut water halved, this will cut the cooking time by 10 minutes. Kokum is a dried fruit from the mangosteen family. It is dark red in colour and will be tart to the taste. It will be moist and tasty enough to eat once its cooked in the curry and re-hydrated. This curry has a pleasant pale yellow colour. This may change and enhance if you decide to add the mustard powder to make the curry more pungent. Chillie powder is not a substitute for the chillie flakes. Its better to add whole dry red chillies or fresh red chillies rather then the powder. For more curry recipes and Parsi Food click The Art of Parsi Cooking; reviving an ancient cuisine. There are as many curries as clouds in the sky or stars in the universe! The base of most is some form of coconut. Fresh or dry, milk or cream, sometimes even just coconut water. The coconut flour to thicken and leave an aroma, the coconut oil to enhance the pungent notes of coconut. And then there is the Arrack liquor. A spirit distilled from the sap of the coconut flower. This is local to Sri Lanka but Arracks are also available from other countires that are made up of fennel (and very liquorice, anise like in flavour, some almost bitter to the taste). While this curry tastes fine without any liquor, adding a teaspoon of the flowery kind of coconut Arrack gives it a unique touch, if you get the gentlest note of burning in the throat while eating this with freshly grated ginger rice, you are spot on! It was definitely one of the meals I most enjoyed on my Sri Lankan holiday. In a pan heat a teaspoon of oil, add the shallots and saute` them till translucent, soft and pale. On medium heat add the coconut and stir for a minute or two. Add the curry leaves, garlic, cumin, fennel and garam masala powders, giving it a quick stir after each addition. Add the cream of coconut. Add the water, bring it to a boil, cook for 10 minutes on a simmer. Add the rest of the ingredients, adjust for thickness by adding plain or coconut water, bring it to a boil again and cover, cook for 20 minutes on a simmer. Add the prawns cook for 7 minutes and serve with ginger rice. Ginger Rice. Many of these ingredients can be over powering. Best to start with smaller amounts of white pepper and fenugreek as well as the Arrack. Gin which is made up of Juniper Berries is the best substitute for the Arrack Liquor. Limoncello the Italian lemon liquor made with vodka is also worth a try. This curry is rough. Its thick and heavily textured and not at all smooth. Substituting red chilli powder for the chilli flakes will change the colour of the curry. For more curries and Parsi Food recipes click The Art of Parsi Cooking; reviving an ancient cuisine. On my travels through Sri Lanka the food was an integral part of the trip. My friends and I were fortunate enough to try diverse varieties of curry and rice. The most unusual rice I had was fresh ginger rice. It intrigued me enough to recreate it which I share on my blog. It complemented a subtle white curry laced with their local Arrack liquor made up of coconut flower sap. Here I have recreated the ginger rice. It is meant to be pungent hence served with a light subtle curry. Wash the rice until it runs clear. Heat the oil, stir in the rice, turmeric, ginger and salt for a minute and then add the coconut water and plain water bringing it to a boil. Allow it to cook on a high flame until the water is evaporated and the rice is visible. Cover tightly, lower the heat to low and allow it to steam for 22 minutes. Garnish with fried onions or coconut. Fresh ginger pulp gives this dish a wonderful aroma and flavour. However a teaspoon of ginger powder substituted can be used. Ginger powder looses its potency when stored for a long period of time. Smell it before adding. If it is not pungent to the nose add more then a teaspoon. Heating the ginger powder in warm oil before adding the rest will help the stale ginger powder come to life. Adding a stick of cinnamon, black peppers, cloves, green cardamoms is just an option to consider. Adjust the ginger according to your palate. For more recipes from the Parsi food flavours click The Art of Parsi Cooking; reviving an ancient cuisine. So many flavours, textures and colours that match perfectly. Made up for Christmas Day it is a wonderful choice for any meat at the festive table. A versatile recipe, use your favourite liquor, it won't matter. Festive and colourful, this flavourful recipe is a perfect combinations for any buffet table. In a skillet pan fry the bacon meat. Remove with a slotted spoon and keep aside. Continue frying with the pearl onion, cut side down, allowing them to caramelise. Do this in batches, to cook through. You may need to add a touch of oil as you continue. Remove and keep aside until all are done. Now add all the chestnuts into the skillet. Give it a light toss and remove. In the same skillet melt the butter with the chestnut flour. Mix well to avoid lumps, add the chicken stock and bring it to a boil. Add the rum and the maple syrup. Boil until desired consistency. Add the bacon, onion and chestnuts into it. Taste and add salt pepper if needed. For the orange and brussel sprouts. Thinly slice one orange, add salt, sugar and sweet rum and marinate for as long as you can, preferably overnight. In a skillet pan fry the chorizo or sausage meat. In the same pan continue caramelising the brussel sprouts. Cooking it in batches is best. Keep the cut side down. 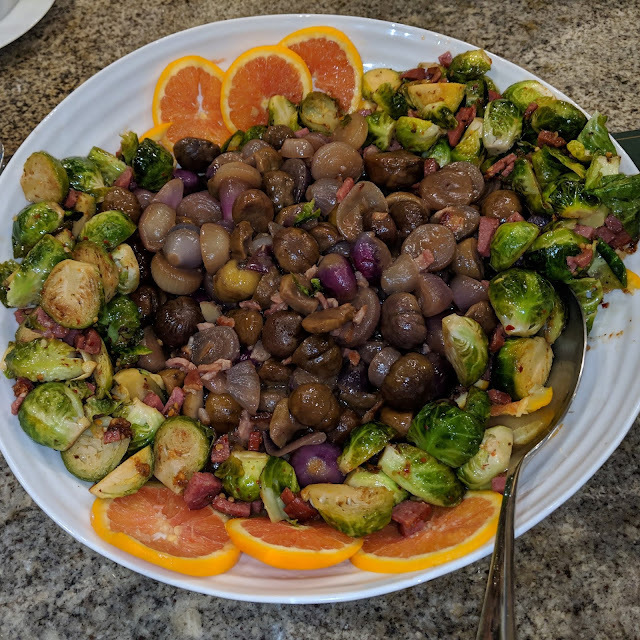 When all of them are done return them to the pan, Toss them well and add the chorizo, and orange juice plus the marinated orange juice from the sliced oranges. Salt and pepper. When ready to serve, warm the onion and chestnuts and pour it into the dish. Warm the brussel sprouts and gently place all around on the bed of marinated oranges. Use the ready vacum packed chestnuts. It saves time and clean up. While the sauce should coat the back of the spoon it cannot be too thick or hard to mix. Add more chicken stock to thin down if needed. You can use any bacon or sausage of your choice. Use bacon with the least fat. Omitting the meats may reduce the intensity of the flavour but it can still be delicious. Do not over cook the brussel sprouts. They will wilt and become discoloured. Using the red/purple coloured baby pearl onions is preferred. 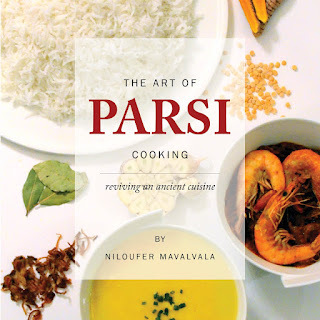 For more cookbooks and ebooks click on The Art of Parsi Cooking; reviving an ancient cuisine. There are as many curries as there are stars in this universe, but this one is also a traditional way our grandmothers and great grandmothers prepared it, at least as far back as the 1850's. A particularly traditional touch is the addition of two tomatoes. cut in halves, added in the last 10 minutes of cooking just to infuse and soften. Served on top of the curry, it is just something that reflects our Persian roots. It is one of those foods that we now find fiddly, its time consuming rather then difficult to prepare. There were no blenders in those days just the old fashioned masala no pathar (art of grinding spices,) lots of strong arms. One took pride in how fine the spices were ground, how tough and capable the person grinding it was! It was definitely a work out. In-spite of all the wonderful blenders we now have at our finger tips, this curry is meant to be granular and thick. While we serve it with rice, it can be eaten with warm crisp bread. Growing up we generally did just that if there were left overs. While the toasting and refreshing of the nuts and spices before grinding can be tedious, the aromas are incredible. The end result varies, depending on the number of short cuts one makes to get to the finished product. Dry roast the first 12 ingredients and grind them. In a large pot heat the oil and fry the masala/spices. Add the lamb, salt, chillies, tomato puree and mangoes. Mix well. Add 3 cups of water bring it to a boil and cook for 45 minutes. Add the lemon juice, check for salt and serve with boiled rice. Dry roasting is a term referred to the process of cooking without the addition of any oil or water. Generally most nuts and seeds are dry roasted to refresh them allowing their natural oils to come up to the surface before grinding. Traditionally tomatoes cut in half are added on a Parsi Gos ni Curry. These are placed on top of the curry at the very end. Just to steam and be soft enough to cut into. Tamarind paste can be used instead of mangoes and lemon. Taste for spice. If you need to turn up the heat add red chillie powder starting with 1/2 a tsp. 1 tsp tamarind paste can be used instead of mango or lemon juice. Crush the green chillies if you want it spicier and add 2 extra for a kick. Use 1 tbsp each of peanut butter, almond butter and gram flour to alternate getting fresh nuts. However you cannot roast any of these. Use limbu if available. If not, lemons and limes are acceptable. Travelling the world is a passion I hope I never tire from. While many travel to see the place, my primary goal is to taste the place. On my recent trip to Sri Lanka I had the pleasure of tasting so many curries. What pleased me most was the fact that there was an endless choice, all labelled as curry. This particular curry was simple and unusual. I have decided to recreate it to the best of my ability through the palates eye and mind. In a pan cook the washed dar with the turmeric, salt, water and butter. This should take an hour. Do not over cook or turn into a mush. Add the kokum for the last 15 minutes. This allows the dry kokum to rejuvenate and burst with its flavours. In a fry pan heat the coconut oil and add the onions, lightly saute and add in order so it cooks well and does not burn. Loosen it with the coconut water and pour over the cooked dar stirring it in. The finished dish should be moist but not watery. Serve either warm naan, sri lankan roti, paratha and pappadum. Kokum is a dry fruit and is tart, for best results it needs to be soaked in hot water for 15 minutes before adding. To avoid this step I like to add it to the boiling pot of lentils toward the end. The best substitutes to kokum are a tsp of tamarind pulp or freshly squeezed juice of a lemon. The tamarind will make the colour darker and brown, while the lemon juice will keep the bright golden yellow. Palm sugar is often substituted with jaggery, coconut sugar, brown sugar or demerara. The pandan leaf is hard to touch and you need just a few pieces to add. It has an aroma of raw rice and is easily found in South Asian stores. If shallots are unavailable use small yellow or white onions. Shallots are generally sweeter while larger onions can be sharper. This dhal curry is served with a sambol made up of coconut or caramelised onion and a sweet and hot mango chutney.